fenced square covered in white gravel. In the middle was a circle, divided into three sections and outlined with bricks. Each section had a mound of brilliant green stuff. The one I remember most smelled like lemons. How. Does. That. Happen?! I kept that leaf for months. Germantown, Tennessee farmer's market. 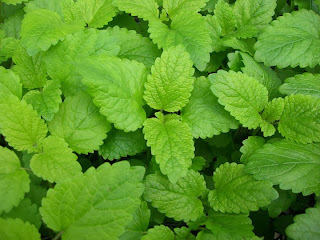 The Herb Lady there felt like lemon balm must be the plant I was describing. She was pretty old by my standards back then, probably 50. My mom, who would never waste money on candy or a guitar or a computer, was willing to buy the plant for me. Plants were not a waste of money in her opinion like those trendy computers. Lemon balm is perennial and it's in the mint family. Good thing too. It died in the winter but I kept it like the historic-site leaf. I left it in the orange dish pan and it grew again in the Spring, fluffy and green. My mother explained that some plants come back. She wasn't sure why, so don't count on it happening again. Mom drove me out to an herb fair I read about. It was a long way from our house. I remember the car overheated and I fixed it using some tips I read in Seventeen magazine. The farm turned out to belong to the Herb Lady. I read a lot of gardening books and I killed a lot of plants. The Herb Lady gave up her little farm and started working at a garden center East of town. I graduated from high school, went to college and got married. My sister had a friend who worked at the garden center East of town. I shopped there a lot but I don't remember how I got the job. The Herb Lady had quit. She got married and started nursing school. I became the Herb Lady. And one day, Rebecca thought "I will buy my dream!...a green house at the beach! It sounds better when you say it like that.